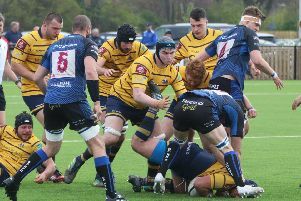 WORTHING Raiders Rugby Club won for the fifth successive National 2 South match with a entertaining victory at home to in-form Chinnor on Saturday. Raiders touched down six tries in a game which had three red cards – one for Worthing and two for Chinnor – after a brawl midway through the second half. Chinnor went into the game in fine form with wins over the top two, Henley Hawks and Dorking, in their previous two games. However, Raiders, who were playing against a blustery wind in the first half, made a quick start and touched down their opening try after just 90 seconds. Finlay Coxon-Smith broke forward and off-loaded to Ben Loosmore, who made ground before a long pass out wide to Matt McLean, who dived over. McLean was unable to add the extras and Chinnor’s Sam Angell was off-target with a penalty on six minutes. Worthing continued to defend well, before they extended their lead on 27 minutes when they drove forward from a line-out and Liam Perkins touched down but McLean’s conversion attempt drifted wide. The visitors’ Frank Jones was held up on 30 minutes, before Chinnor got their first points of the game on 34 minutes. Alfie To’oala broke from the back of a scrum to go over and Angell converted. Worthing touched down their third try just two minutes later as Coxon-Smith burst past several players, before sprinting past the last man, with McLean converting. Chinnor reduced the deficit in the last action of the half when Jake Olley easily skipped past several players to touch down and Angell converted to make the half-time score 17-14. Raiders got the four-try bonus point five minutes after the break when the ball was worked to Loosmore, who held off a challenge to go over but McLean’s conversion went wide. The visitors held on for ten minutes when Jack Hayes was in the sinbin – although Raiders felt Scott Barlow had touched down but the touch judge deemed he had grounded the ball just short. Then came the incident where three players were red-carded on 61 minutes. After Raiders’ Kieran Leeming was pushed into touch, a coming-together ensued between a number of players from both sides. After the referee consulted with the touch judge, Worthing’s Perkins and Chinnor’s Hayes and Ian Stock were all shown straight red cards. Joe Marchant made the most of the two-man advantage when he sprinted through to touch down on 72 minutes, with McLean adding the extras. Worthing then added a sixth try five minutes from time when man-of-the-match Loosmore burst from his own half to go over and McLean again converted. Raiders head coach Kieron Dawson said: “I enjoyed that, it was a great game of rugby. We scored six tries and could have had a seventh but I felt we dominated from start to finish. We just had that one lapse in concentration just before half-time, when we let our concentration slip a little bit which was the only disappointing thing. “I felt we dominated the other 79 minutes and were brilliant, absolutely brilliant. Dawson admitted the performance was even more pleasing than their wins against Henley and Dorking and said: “You have to put this into context. They beat Dorking last week and Henley the week before, so they are the team that everyone is worried about and we schooled them, to be honest. “It’s really, really pleasing, even more so than the Henley and Dorking performances. “It’s another bonus point, which is nice and the most pleasing thing wasn’t just the result but the performance. On the incident where the three players were sent off, Dawson said: “We were on the far side, so I didn’t really see what happened but the pleasing thing, bizarrely for me, was that our entire team got involved. It showed the solidarity and team unity that we have. “Liam will probably get at least a one-game ban. It will probably be fairly evident on the video but he said he was just defending himself as he felt he was being attacked. The win moved Raiders up a place to fifth in the table, level on points with fourth-placed Taunton Titans, who they travel to on Saturday. RAIDERS: McLean, Forrest, Loosmore, Coxon-Smith, Marchant, Leeming, Waters; Storer, Luke, Sargent, Barlow, McGowan, Smith, Redmayne, Perkins. Subs: Hewick, Walker, South, Dudley, Miles.